Two days after auditors reported that it knowingly contravened tax law and should be probed for VAT fraud, a forensic supply company Crimetech Laboratories landed a R30-million contract with the South African Police Service. By SALLY EVANS for AMABHUNGANE. The R30-million South African Police Service (SAPS) contract was awarded to Crimetech Laboratories on 20 April 2015 while the current acting national commissioner of police, Khomotso Phahlane, was in charge of the police’s forensic division. Suspended police colonel Sandragasen Moonsamy has charged that Phahlane is ultimately responsible for procurement abuses under his watch – and Crimetech is central to his allegations. The police have described as “ridiculous” any suggestion that Phahlane was involved in the awarding of contracts. Crimetech featured prominently in a wide-ranging investigation of the forensics division, ordered by former police commissioner Riah Phiyega in 2013. In their report, sent to affected parties by Phiyega on April 18, 2015, CPN Forensic and Accounting Services (CPN) found the company “knowingly acted in contravention of Sars (South African Revenue Service) legislation”. They said they found VAT discrepancies in documents submitted by Crimetech in support of bids for police tenders in 2009 and 2011. Based on these, they recommended that Sars should investigate the company. Yet two days later, on April 20, Crimetech won a R30-million contract to supply the police with “fingerprint powders, powder suspensions, fingerprint brushes, tape lifters and other fingerprint consumables”. A year later it remains unclear whether police have followed CPN’s recommendation. A police spokesperson told amaBhungane last September that Phiyega was still waiting for input from implicated parties before deciding what action to take. A month later, she was suspended. Phahlane has replaced her. SARS did not respond to a query on whether it had been alerted to the auditors’ findings on Crimetech and its owner, Henry Deale. The investigation by CPN stemmed from allegations of maladministration aimed at Phahlane by police union Popcru between 2011 and 2012. Popcru raised concerns over a centralised procurement system Phahlane introduced during 2011, shortly after he was put in charge of the forensic division. The auditors drew a link between the introduction of this system and a rise in complaints that Crimtetech’s products were substandard, overstocked and out of date. Deale denied his products were not up to scratch. “Over a period of 19 years, after supplying thousands of bottles of fingerprint powder and still being the preferred supplier of fingerprint products should be clear testimony that our products outperformed all imports year after year. Customer complaints are investigated and remedied promptly,” he said. Police spokesman Brigadier Hangwani Mulaudzi said Popcru’s allegations of mismanagement against Phahlane were “baseless, unfounded and unsubstantiated”. However, two statements that came to light in February have breathed new life into the allegations. The statements, one by Moonsamy and the other by Deale’s ex-wife, Suzette Hartmann, form part of a docket forensic investigator Paul O’Sullivan lodged with the Independent Police Investigative Directorate. In the docket, O’Sullivan claims that despite providing Phahlane with evidence allegedly pointing to retired detective’s head Vinesh Moonoo’s connection with underworld figures, he was ignored. Instead, he claims he has faced an onslaught of police harassment and intimidation. After lodging the docket O’Sullivan was arrested on immigration-related charges on April 1. In his February 3 statement, Moonsamy says that as head of East London’s local criminal record centre, he observed at first hand the quality and distribution of Crimetech’s chemical products. He claims that under Phahlane’s command the forensic division wasted R50-million on unnecessary orders for chemicals, and procurement processes were flouted. O’Sullivan said he came into contact with Moonsamy last year when the policeman reached out to him because he was disillusioned with the lack of action on his complaints. In his statement, Moonsamy says chemicals supplied by Crimetech under a 2011 contract were expired due to slow delivery. Aero print canisters exploded and supplies of incorrect fingerprint brushes were “destroying crime scene evidence”. 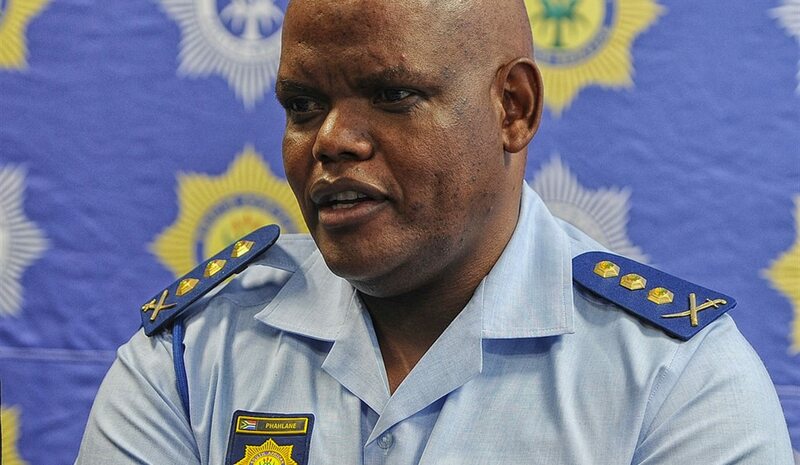 He says that during 2012 or 2013, on a visit to Bisho police training college in the Eastern Cape, Phahlane insisted that despite the risks of the canisters exploding, “we must use them or suffer the consequences… It was clear to me that his approach was unlawful”. He added that Phahlane “clearly knew” Crimetech was being dishonest when it delivered outdated, incorrect or faulty stock. “His only response was to chastise anyone from speaking out”, Moonsamy alleges. Shortly after O’Sullivan’s arrest Moonsamy was suspended, although he appears to qualify as a whistleblower who should enjoy protection in terms of the Protected Disclosures Act. He now faces internal charges for “engaging” the media and for calling for an investigation into Phahlane. In 2012 Phahlane lodged a civil suit against three police whistleblowers whose concerns were taken up by Popcru. Mulaudzi denied that Phahlane was involved in awarding Crimetech the April 2015 chemical supply tender: “The awarding of contracts falls outside the scope and mandate of the divisional commissioner… It is ridiculous to suggest that the acting national commissioner awarded contracts. “The department follows procurement policies and systems without any deviations, thus there is no justification to respond to your misplaced and uninformed tax related allegations,” Mulaudzi said. CPN’s forensic report found that shortly after taking charge Phahlane centralised the procurement system so that products were delivered to the national criminal record centre before being distributed the local centres countrywide. Popcru’s gripe was that the system was open to abuse, because once they were paid, suppliers had less incentive to redistribute products. In its investigation CPN also found that the total payments to Crimetech “reflected a drastic increase over the period of three years”. For the 2010/2011 financial year orders worth R9.7-million were submitted, compared to R33.8-million in 2011/2012. In its report, CPN said the increase was due to an escalation in orders submitted shortly before a contract expired. They discovered that the same items were ordered after very short intervals “even before the previous orders had been fulfilled”. Brigadier S Diko, the section head for crime scene management, told CPN the escalation could be explained by crime statistics, which “would have reflected the need for an increase”. But CPN said a “cursory investigation” of the orders, delivery notes and invoices relating to Crimetech’s supply of chemicals in 2011 to 2012, “revealed serious concerns”. The auditors found evidence that Crimetech included a 14% VAT component in its invoices, although SARS said it was not a registered VAT vendor over the relevant period. The 2011 contract was awarded “specifically on the basis of a VAT-inclusive price per unit”, CPN said, while a VAT registration number was not indicated on Crimetech’s invoices. In an initial response to queries, Deale said the company was not required to register for VAT because its turnover was below the legal threshold. But in bid documents Deale submitted for the 2011 tender he reportedly indicated a total annual turnover of R5-million,“an indication that the entity was compelled to register for VAT”, CPN found. Legislation stipulates that VAT registration is compulsory if a company makes taxable supplies of more than R1-million over 12 months. In Crimetech’s bid for the 2011 contract Deale indicated that VAT registration was pending, but quoted unit prices as VAT-inclusive. Crimetech became VAT registered on June 30 2012, but was paid for orders from June 29 2011. CPN submits there was “no evidence that the 14% VAT component was ever deducted from the quoted unit price”. It seems police knew of Crimetech’s unregistered status. A Colonel Honiball, head of the forensic division’s support services at the time, reportedly admitted to the auditors that “during 2011/2012 [Crimetech] was not VAT-registered”. Yet Honiball did not “liaise with the supplier in this regard … it also did not occur to him that historically the fact that the supplier was not a VAT vendor had effect that the supplier received VAT which was seemingly not paid over to SARS”. When amaBhungane asked Deale to clarify some of his responses his lawyer, Lizanne Coetzee, said her client would not comment further on queries relating to Crimetech and Deale’s tax status. Meanwhile in Suzette Hartmann’s July 2014 statement, which apparently formed part of a Special Investigations Unit investigation, she accused Deale of tax fraud. Hartmann says she decided to make the statement when SARS questioned her about a company Deale previously traded through, Crime Investigation Technologies (CIT). Hartmann claims that in February or March 2010 SARS informed her that CIT had paid no tax, including VAT, since 2008. Hartmann says she was still a member of the company because Deale refused to remove her name. Hartmann states that in 2008 the forensic division’s finance department asked Deale to resubmit a tax certificate for CIT. But he allegedly only submitted a new certificate in May 2010, issued under another name, Crimetech Laboratories CC. Crimetech was registered in 2009. Deale said the waste tender contract “would not have been awarded if any documentation was absent”. amaBhungane put Moonsamy’s allegations to Phahlane, including the claim that Phahlane “protected” Crimetech despite complaints about its products. Spokesperson Brigadier Mulaudzi said: “The issues raised by you are clearly responded to in the report by the general contained in the investigation report – which is in your possession.